The Alesis Strike Electronic Drum Kit combines the playing feel a familiar setup of an acoustic kit, with the versatility and reliability of the finest electronic drums. If you're looking to make the move over to an electronic kit from an acoustic, but don't want to sacrifice on feel, then the Strike Zone kit is the perfect choice. The design incorporates large dual-hoop pads with wood shells that are built to the same size and depth as standard acoustic shells, i.e. 14-inch snare, 8-10-12-inch toms, and 14-inch kick. Switching between an acoustic kit and the Strike Zone is much smoother thanks to this subtle yet important design consideration. The mesh heads offer exceptional performance control, whilst sensitivity adjustment knobs allow you to optimise the response to suit your playing style. The Strike cymbals are comprised of: a 16-inch 3-zone ride cymbal; a 14-inch crash with choke; and a 12-inch hi hat. The cymbals have been designed to capture the playing feel and response you'd expect from high quality cymbals on an acoustic kit. They have also been given a larger bell area to offer enhanced playability. 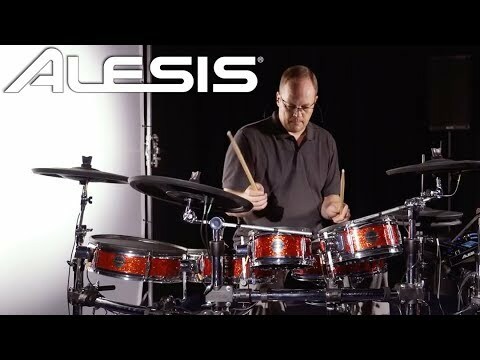 Alesis have even given the cymbals a cool "hammered" finish. The Strike Performance Module is a powerhouse that has an expansive arsenal in its sound library for you to perform with. There are 200 drum kit locations that are made from over 1000 multi-sampled instruments. The module is equipped with on-board sampling capabilities for you to create your own unique sounds, as well as SD card storage - which enables you to load in sampled sounds). The module has USB/MIDI connectivity, which means that it can be used in conjunction with your DAW of choice for easy recording. The kit comes with the powerful new Strike Software Editor, giving you the ability to create your own custom kits, and instruments. The built-in 4.3-inch colour LED screen gives you quick visual access to your settings, so that you can get on with performing. To complete the striking design, the system is built around a solid, premium 4-post chrome rack that provides stability and durability throughout the most aggressive of performances and to get you playing from the word go, there's also an included set of drum sticks.